Ladies and gentlemen, we are gathered here today to witness the union of two nobody ever thought would join. By the powers vested in me, I give you: Solar Energy and Natural Gas. The Department of Energy’s Pacific Northwest National Laboratory has developed a method of combining solar energy into the natural gas production process to produce cleaner energy output with the same fossil fuel input. Put simply, natural gas power plants will soon be able to produce more electricity while using the same amount of natural gas. What’s more, the process reduces greenhouse gas emissions from natural gas power plants at a cost that is competitive with traditional fossil fuels, creating a win-win-win scenario. Natural gas is the next oil or gold rush. As production skyrockets, Americans are demanding natural gas as a cheap, slightly cleaner alternative to other energy sources. As demand rises, natural gas power plants are being constructed at an alarming rate to take advantage of low cost fuels. With this new method, scientists have sweetened the taste of natural gas even further. The product, dubbed “syngas” for synthesis gas, consists of hydrogen, carbon monoxide and at times carbon dioxide. Concentrated solar energy is used to add heat to the thermo-chemical process that yields partially synthetic natural gas. Although still containing harmful atmospheric contaminants that contribute to global warming, this process makes the overall production of natural gas more efficient without contributing to the carbon footprint. The solar technology used in this application is not new. 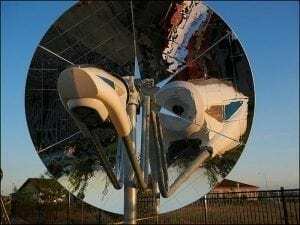 The system uses parabolic mirrors to concentrate the sun’s thermal energy onto a catalyst that transfers heat into the power plant. A power plant in the pacific northwest will begin testing the technology this summer with expected promising results. Power plants that use this technology could be considered hybrid fuel power plants, opening a door to a whole new type of energy generation. Who knows, as technology evolves, solar energy could make up a more significant portion of the energy (and non-existent emissions) of electricity generated from natural gas.